It’s funny how different things go on live than on beta. With regard to the Tillers, on beta, the first people I became best friends with were Jogu the drunk, Farmer Fung, and Gina and Tina Mudclaw. I never got close to being buddies with any one else. Now on live my first BFF is Sho! With Tina Mudclaw coming in a close second either tomorrow or the next day. Sho sends you a couple of gifts to celebrate your new friendship. 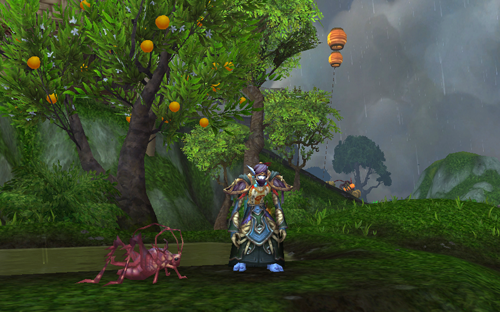 First she plants a nice Orange tree on your farm, and then she sends you a new pet. The Red Cricket! After that I decided to run a few heroics with some of my guildies from From the Ashes. I racked up some achievements there. After that I decided to work on Archaeology. I was getting close to 600 skill points. Plus there was the Serpent Riders daily quest that I still had to do. First I picked up a couple of pristine artifacts. The Pristine Mogu Runestone on display in my slowly growing museum. 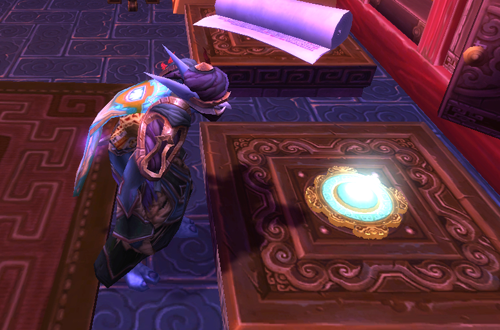 I was able to solve the Pristine Mogu Runestone and Pristine Monument Ledger and put them on display in the Seat of Knowledge. Along the way a few rares popped up in my journal. So I pressed on, gathering enough fragments to piece together the Spear of Xuen, Umbrella of Chi-Ji, and an Anatomical Dummy. I WILL melt your face if it’s the last thing I do!!! And I racked up some more achievements. I FINALLY got the Professor Title!!! And I finally hit 600 in Archaeology! Woot, now I can buy Tol’vir fragments from Bran Bronzebeard and maybe, just maybe I’ll eventually get that pet mummified hand. You know, the one that looks like “Thing” from the Addams Family. Grats on all your achievements, gifts and discoveries.